A large-scale retrospective analysis in patients revealed that expression of the nuclear hormone receptor "retinoic-acid-receptor-related orphan receptor gamma" (RORgamma) could predict pancreatic cancer aggressiveness, since it correlated positively with advanced disease and metastasis. Drug resistance and relapse remain key challenges in pancreatic cancer, with current multidrug chemotherapy regimens failing to eradicate all cancer cells. 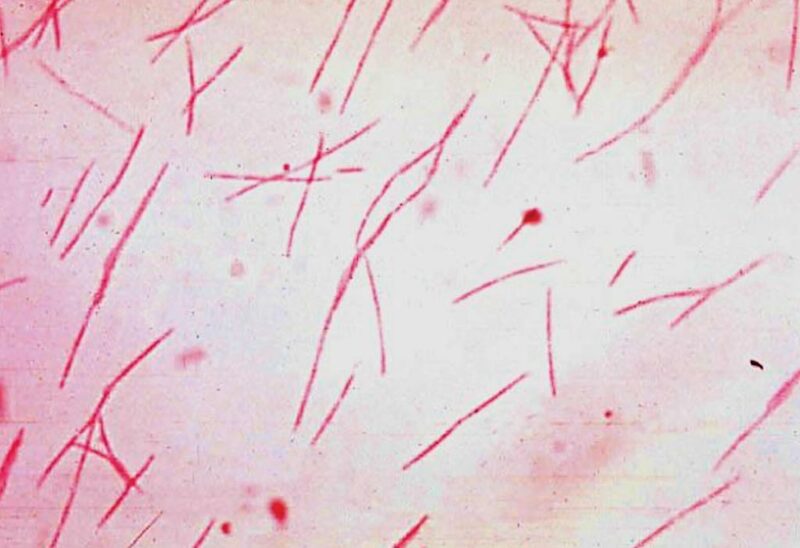 The remaining drug-resistant cancer stem cells can drive tumor regrowth and metastasis. 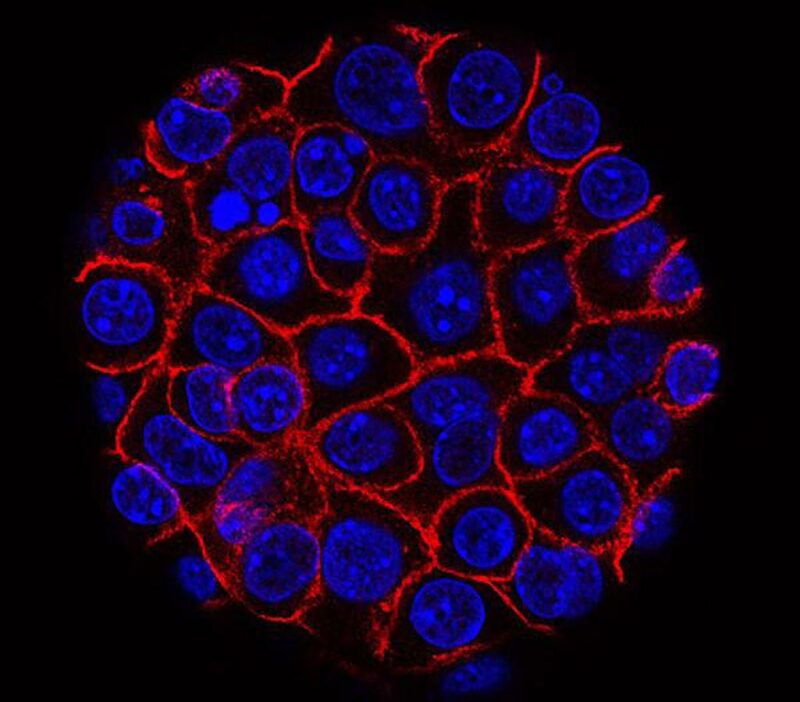 Image: Pancreatic cancer cells (blue) growing as a sphere encased in membranes (red) (Photo courtesy of the U.S. National Cancer Institute). Investigators at the University of California, San Diego (USA) used RNA sequencing (RNA-seq), chromatin immunoprecipitation (ChIP)-seq, and genome-wide CRISPR analysis to map the molecular dependencies of pancreatic cancer stem cells. This integrated genomic approach revealed an unexpected utilization of immuno-regulatory signals by pancreatic cancer epithelial cells. In particular, RORgamma, known to drive inflammation and T-cell differentiation, was upregulated during pancreatic cancer progression. In contrast, genetic or pharmacologic inhibition of RORgamma led to a striking defect in pancreatic cancer growth and a marked improvement in survival. Furthermore, a large-scale retrospective analysis in patients revealed that RORgamma expression could predict pancreatic cancer aggressiveness, as it positively correlated with advanced disease and metastasis. "These studies revealed an unexpected role for immuno-regulatory genes in the maintenance of the most aggressive, drug-resistant cells in pancreatic cancer," said senior author Dr. Tannishtha Reya, professor of pharmacology and medicine at the University of California, San Diego. "Our work shows that immune system signals are hijacked by pancreatic cancer, and suggests that therapies currently being tested for autoimmune indications should be considered for testing in pancreatic cancer. "Using genome scale approaches to map stem cell dependencies in pancreatic cancer will be invaluable for understanding the basis of therapy resistance and recurrence and for discovering new vulnerabilities in pancreatic cancer. Beyond providing new scientific insight, this work can help identify pathways for which clinical grade inhibitors may already exist and can thus be rapidly tested in pancreatic cancer," said Dr. Reya. The RORgamma paper was published in the April 4, 2019, online edition of the journal Cell.